With so many hot trends this season, it's can get a bit difficult to choose which one to go with but thanks to the Zigi Soho Printy Floral Pump, you don't really have to choose. 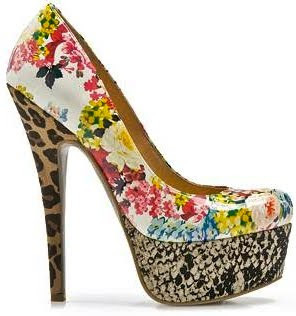 This multiple personality pump features a faux patent leather floral, snake, and leopard prints. I discovered this captivating 6" heel with 2" platform stiletto pump when I walked into the newest DSW on 34th between 7th & 8th Ave. It was love at first site when my eyes met this pump; I was spellbound, so you can guess the outcome. Size-wise, these do run a bit short and narrow, so for those who are also captivated by these, I advise that you get a half size bigger. Other than that, they are quite comfy even with the height. The price is pretty darn comfortable as well - at $79.95, you should grab them while before they're gone. these are the most beautiful shoes i have ever seen!!!!!!!! I wanna marry these! !